2 by 3 Heroes: And we're back. Sorry about that, folks. This post was meant to be published on Monday, but I had to get around to writing it first. It's been a trying week up until now. Currently my fridge is halfway in out in the kitchen because the condenser fan decided to seize up. Everything was getting melty in the freezer section and the compressor and coils were boiling hot. But it wasted either of those, not the start relay. It was just so hot from the lack of air flow it shot down. I have the fan on order, so right now a box fan is keeping everything running. My daughter and her man came into town for a wedding on Saturday. They were busy, but we got to see them Monday and Tuesday. I forget what we did Monday night. I just know I was nowhere near the computer. I think we went up the road to the brother in laws. I was up at 4:45 to head into the office on Wednesday. First time in almost a year. My wife was having some of her teacher friends over, and there was no way in hell I was going to be in the house with a bunch of cackling women. Her friends are nice and all, but would any of you want to be stuck in a house all day with 7 or 8 women? <sob> Was wasn't I invited? So I bolted to the office. First time in a year I was there. But besides avoiding the comments from the ladies, I had a stack of old binders waiting for me. All I need is some shelf space and I can get more sets out of boxes and into pages. Plus, on the way home was a Meijer that I haven't been to in a while. Might there be a discounted blaster of Golden Age on the shelf? Plus a blaster of Stadium Club. No auto in that box, unfortunately, but I can tell you that the Golden Age blaster added 16 cards to the other pile in the giveaway. In fact, the 2nd place person will be just 23 cards short of the base set. However, the more important matter is did I pull a relic I needed. The set is just 8 cards and I have 4 of them - 50/50 chance. OH YEAH! Boring swatch for sure, but it is Liberace. No shock that it's white, I guess. It should have some sequins on it. All his cards on ebay have the same plain white swatch. That's ok, cuz it puts me only 3 cards short of the set - a 2nd Liberace, a 2nd Hank Williams and a 3rd Willie. Speaking of Willie, let's giveaway some cards. Go figure - two Dodger fans win. Greg (of Plaschke) and gcrl (of the active FrankenDodger) come out on top, so to speak. So full set to Greg and 85% complete set to Jim. Plus, I have about 50 dupes, so we'll give a consolation mailing (no relic) to P-Town Tom. Mainly cuz I have no other idea what to to with them. I get tired of stuffing items in odd places. Guys, I should mail over the weekend before we make the run to Denver. And congrats to you all. 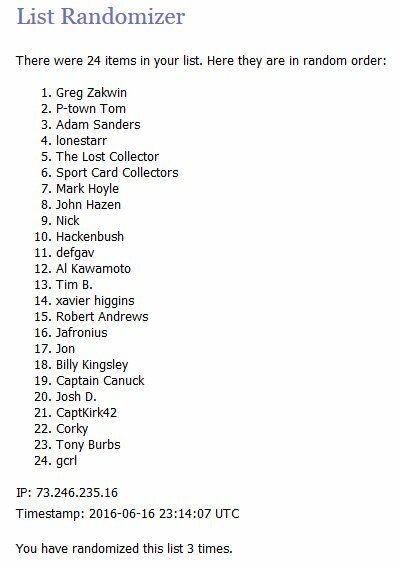 Congrats to the winners, it sounds like they are going to be getting some really great cards. 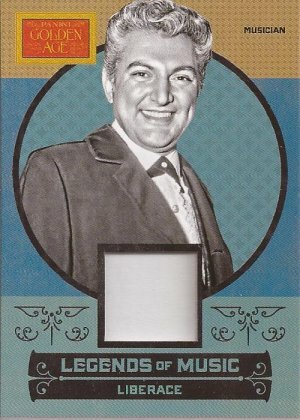 Oh, and the Liberace might appear boring, but those cards sure seem to sell well on eBay. If someone else would like the 50 dupes feel free to speak up! I was hoping for a Willie relic, but it was not meant to be. But that's okay, because I can't stop watching her pull that egg out of that "odd" place. Congrats and that is a sick Liberace!